VISALIA, CA--The Rawhide played from behind starting in the first inning after the Giants score off an RBI-single by Joey Bart . The Giants would continue to add to that lead with a sacrifice fly from Heliot Ramos to score Bryce Johnson in the second inning. After pitching three innings, Jeff Bain (0-1) was replaced by Cole Bartlett . In the fourth, Jean Angomas walks and Kyle McPherson doubled down the right field line and Angomas scored off a throwing error from Anfernee Grier. On the mound for the Giants, Jose Marte pitched three innings and gave up one hit and two walks while striking out three. John Russell relieved Marte in the fourth and immediately gave up a solo shot to Yoel Yanqui on a 3-1 pitch. After that, Russell settled down and retired the side. San Jose answered with a 4-run fifth inning, starting with another RBI single by Bart that scored Heliot Ramos. Ryan Kirby reached base on a fielder's choice by Jancarlos Cintron , who received a fielding error after Bart was safe at second. David Villar then singled to left-center field, which scored Bart to make the score 5-1. McPherson tripled to right-center field to make it a six-run lead. Erbert Gonzalez came in to pitch for Bartlett and struck out Logan Baldwin to end the inning. Visalia would only get two more runs in the game. Cintron had an RBI single in the fifth to score Ryan Grotjon and another RBI single to score Yan Sanchez after his lead off triple. The Giants would not score the rest of the game, thanks to Gonzalez's three and a third inning performance. He gave up one hit and struck out five. The final score was 7-3 and the winning pitcher was Raffi Vizcanio (1-0), who entered the game in the fifth inning and prevented the Rawhide from scoring the rest of the game. 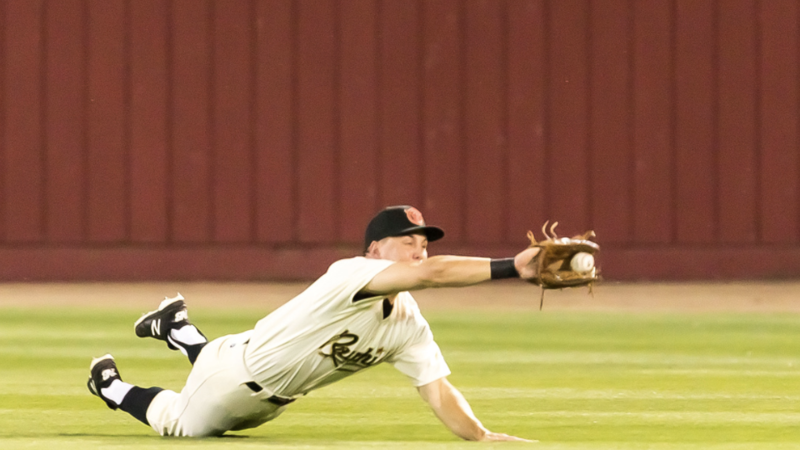 Tomorrow the Rawhide look to bounce back as they host the Giants again at Recreation Park at 7pm. Josh Green is expected to start for the Rawhide and John Gavin is the probably for the Giants. The Visalia Rawhide are a professional baseball team in the Class A Advanced California League and are the only professional sports team in Tulare and Kings counties. The team has been an affiliate of the Arizona Diamondbacks since 2007 and is entering their 73nd year of play in 2019. The Rawhide renovated their home at Recreation Ballpark in 2009 and have since become the largest gathering of individuals in Tulare County. In 2019, the Rawhide look to continue their reputation for hosting competitive baseball while providing affordable family entertainment. To be a part of the 2019 Visalia Rawhide season, please contact the Visalia Rawhide Ticket Office at 559.732.4433, visit us online at rawhidebaseball.com, or follow us on Facebook (TheRawhide), Instagram (@VisaliaRawhide), and Twitter (@VisaliaRawhide).